Text (John 20:19-31, ESV): 19 On the evening of that day, the first day of the week, the doors being locked where the disciples were for fear of the Jews, Jesus came and stood among them and said to them, “Peace be with you.” 20 When he had said this, he showed them his hands and his side. Then the disciples were glad when they saw the Lord. 21 Jesus said to them again, “Peace be with you. As the Father has sent me, even so I am sending you.” 22 And when he had said this, he breathed on them and said to them, “Receive the Holy Spirit. 23 If you forgive the sins of anyone, they are forgiven; if you withhold forgiveness from anyone, it is withheld.” 24 Now Thomas, one of the Twelve, called the Twin, was not with them when Jesus came. 25 So the other disciples told him, “We have seen the Lord.” But he said to them, “Unless I see in his hands the mark of the nails, and place my finger into the mark of the nails, and place my hand into his side, I will never believe.” 26 Eight days later, his disciples were inside again, and Thomas was with them. Although the doors were locked, Jesus came and stood among them and said, “Peace be with you.” 27 Then he said to Thomas, “Put your finger here, and see my hands; and put out your hand, and place it in my side. Do not disbelieve, but believe.” 28 Thomas answered him, “My Lord and my God!” 29 Jesus said to him, “Have you believed because you have seen me? Blessed are those who have not seen and yet have believed.” 30 Now Jesus did many other signs in the presence of the disciples, which are not written in this book; 31 but these are written so that you may believe that Jesus is the Christ, the Son of God, and that by believing you may have life in his name. Beloved in Christ: Today’s gospel is difficult for skeptical people to hear. No, I’m not talking about all that talk of people seeing someone who had risen from the dead. I’m talking about someone claiming to have the power to forgive sins and to authorize others to do so. The reason is that forgiveness seems so unreal to us. We conjure up images of two kids being forced to say, “I’m sorry,” and shake hands after they have had a squabble. Neither kid is really sorry. They may be sorry that they have to undergo this experience with their teacher or parent looking on, but they are not sorry for having said the mean words or shoved their classmate. And neither kid is willing to forgive the other. No, real forgiveness seems all too unbelievable a concept to us. And even if we know that somebody else decides to let go of their anger for a bit, how do we know that it won’t come back? Bygones are never really bygones among human beings, even in families and among the best of friends. Consequently, when we come to a Christian church and hear that our sins are forgiven, we immediately think that people are living in a fantasy world. People forgiven of their sins? Next thing you’ll tell me that you saw the tooth fairy riding a unicorn to visit a leprechaun friend. Perhaps people in the church are so disconnected from reality that they refuse to take sin seriously and so they dish out absolution left and right. “Murder can’t be all that serious, can it?” they say, as they absolve serial killers. Who would want to hang out with people so divorced from reality that they cannot see the horrible consequences of crime and forgive people after just a minute or two of thought? Don’t they understand the cost of forgiveness? Of course, we do. The cost of sin and crime and wickedness and evil is to be found in the hands and feet and side of our Lord. The cost of sin had to be paid—and our Lord paid it in full on the cross. If you think that your sin is not that big, then look at His pierced hands and feet and side and say, “You really didn’t need to do that.” Of course He had to. It was my sins that sent Jesus to death. It was your sins that nailed Him to the cross. Though we are respected by our neighbors, we know that we have done such irreparable damage by our wickedness that Christ’s death on the cross was the only way to repair it. It was, after all, the risen Lord’s body that they were seeing. If they had merely been looking at His corpse, I suppose that they wouldn’t have had the same assurance. To be sure, He had said, “It is finished” while He was on the cross. Those words would have been written on a bill whenever the account had been paid in full. And so from those words you would think that He would have paid off our debt so that we could be fully forgiven. But how would we know for sure that this was the case, if He remained dead? Maybe He had jumped the gun. Maybe He had assumed that He had fully discharged the debt, only to forget that there were some more bills He needed to pay off. Therefore, He had to rise from the dead. God the Father had to raise Him from the dead to show that the Father did indeed fully approve of His work on the cross. That is why Christ asked His disciples to poke and prod Him and to see that He really was alive. He wanted His forgiveness to be as tangible as His body. He didn’t want there to be any doubt. Forgiveness was as real as His hands and side. Forgiveness was as real as His warm breath upon them. He brought forgiveness down to earth from the realm of fantasy and made it real. But that forgiveness was intended for all people, not just those who happened to be present in the upper room. He gave His disciples the power to forgive sins. They had the Holy Spirit and so they had the power to forgive sins and, when necessary, even to withhold forgiveness. Obviously, our Lord was not encouraging private vendettas with these words, but was acknowledging that there would be some unrepentant people who should not be forgiven until they confessed their sin. By the same token, He wasn’t telling His disciples to give their friends indulgence to sin to their heart’s content. Instead, He was giving them the power to forgive the guilt of troubled sinners. Many people struggle with that concept. They grant that someone like Christ, who is God and who bore our sins on the cross, has the authority to forgive sins. But many people, including (sad to say) Christians, think that nobody else has the power to forgive. Who are we Christians—and especially pastors—to be meddling in the matter of God’s forgiveness? Sure, we can forgive other people as far as we are concerned, they say, but we can’t give them God’s forgiveness. Why not? Jesus gave that power to His disciples. In so doing, He gave it to the church throughout the centuries, including her ministers and pastors. He gave us the Holy Spirit. And He gave us the authority to forgive as He would forgive and to withhold forgiveness as He would withhold it. When we do so, it is not our forgiveness, but God’s forgiveness. When I was eighteen or so, my neighbors were going to go on vacation. I and my sisters had always mowed the lawn for them and fed the cat whenever they were away. This time, however, they asked me to drive them to the airport. We lived on the east side of town and the airport on the west side of town, probably a good hour drive, round trip. But they asked me to drive them in their vehicle. It was a nice car, a really spiffy Chrysler, if I remember correctly—not exactly a young person’s car, but still a treat to drive. I was to drive them to the airport and drop them off and then return the car to their garage. When they were to return, I was to go and pick them up at the airport. I did it all without incident. Now consider this question. Would it have been all right for me any time before that incident to have taken that car out of the garage and just tooled around town? Of course not. It would have been stealing. But they wrote out a letter giving me the authorization to drive the car to and from the airport on the specified days. If I had been pulled over by the cops and asked why I was driving the car, I could have shown them the letter, and all would have been all right. But what if I decided to abuse my privilege and go Hot-Roding with that vehicle for the two weeks while they were gone? I would have been in big trouble. And what if I decided to leave the car alone and not go and pick them up at the airport? I would have also been in big trouble. That is a good picture of the power to forgive sins. If I were to usurp that power from God without His authorization, I would be in trouble. If I were to abuse that power by forgiving unrepentant sinners whom He does not want forgiven or to refuse forgiveness to repentant sinners whom He wants forgiven, I would be in trouble. And if I neglected that power altogether and acted as if He hadn’t given me the authority and responsibility to forgive, I would be in big trouble. Of course, if some people struggle with the idea of someone forgiving in God’s name, others struggle with the idea of receiving forgiveness in God’s name. 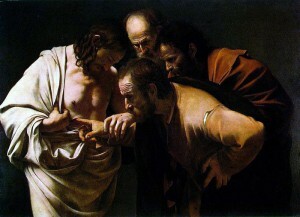 Thomas doubted that Christ had arisen, much less commissioned his fellow disciples to evangelize him with the good news. But Jesus appeared to Thomas, not only to convince him that He had risen from the dead, but also to convince him and others always to listen to Christ’s words. That is why our Lord appeared to the disciples and to Thomas. He took these skeptical people and made them His apostles. He led them to teach us that “If we say we have no sin, we deceive ourselves, and the truth is not in us. If we confess our sins, he is faithful and just to forgive us our sins and to cleanse us from all unrighteousness.” May we learn from these apostles to experience the real forgiveness God gives and then to share it with others who need it, too. In Jesus’ name. Amen.